Mola Mola Bali (Ocean sunfish) at Crystal Bay, Nusa Penida. You can see their unusual shape in this photo and, believe it or not, their closest relatives are pufferfish, porcupinefish and filefish. The weird-but-wonderful-looking Mola-Mola (Ocean sunfish) is a major attraction for scuba divers coming to Bali. Mola-Mola are the world’s heaviest bony fish, reaching up to 1,000kg, and can have 300 million eggs. Their two long dorsal fins mean Mola-Mola can be 3.5m in height but, although they have rounded bodies, they are very narrow when seen from front/back (‘mola’ is Latin for ‘millstone’). Mola-Mola in German is ‘schwimmender kopf’ = floating head, In French, Poisson Lune (Moon fish). In fact, most languages have a name for Mola-Mola , some make more sense than others! Ocean Sunfish have a diet of mainly jellyfish, of which they eat huge quantities, so plastic bags pose a big hazard to Mola-Mola (and to turtles, for the same reason). I believe Mola-Mola are in Bali’s waters year-round (recorded as deep as 360m). They generally only come up to recreational diving depths from July to mid-November. Because Mola-Mola suffer from external parasites (up to 40 kinds!) which need to be removed, they drift up in the incredibly cold, but very fertile, upwelling from the 3.5km deep Bali Trough off Bali’s southern coast, to get cleaned. That’s how we are able to see them stationary for any length of time. AquaMarine will show you how to dive with Mola-Mola (Ocean sunfish). Despite their size and having no natural predators (bar humans), Molas won’t come close to the reef and the schools of fishes waiting to clean them, if they don’t feel safe. Therefore, if you see a Mola-Mola (or 4) or your AquaMarine Dive Guide spots one (or 7! ), Just Stop Moving! Seriously: At that stage, do not try to approach Mola Mola Bali, two flips of those long dorsal fins, and they’ll be gone! You need to stay really, really still, close to the reef. Let the fish come closer. Let them settle down and go into their “Cleaning Meditation”. No, I’m not joking. Once a Mola finds a place to get cleaned, it tips 45 degrees upwards, and often slightly sideways, and genuinely seems to go into a “zone”. When that happens: Usually you and your group, rather than the Molas, will be the ones that leave first … maximum bottom time … air supply … the water can be very cold! First: Expect to be in awe! Bannerfishes are the ones we see waiting in great swarms for the Molas; they concentrate on the body. Butterflyfishes focus (no pun intended) on cleaning the eyes. Emperor angelfishes clean the dorsal fins. Cleaner wrasses come out from the reef to clean in-and-around the mouth and gills. Despite being so big, Mola-Mola are actually fairly difficult to find! Therefore, every day during the “season”, between one and three of AquaMarine’s custom-made dive boats (and Dive Guides!) head out to look for them. And we’ve learned to be very secretive about where we’re seeing them! The most likely locations to see Mola-Mola Bali are Nusa Penida and outside Padangbai/Candidasa, although there have been rare early morning sightings on the USAT Liberty shipwreck in Tulamben Bay. Everyone joining a Mola-Mola Bali Spotting Trip with AquaMarine Diving – Bali is required to sign our ‘MM Code of Conduct’. PS: I’ll let you into a little secret – sssssshhh! Here in Bali we actually have Mola alexandrini rather than Mola-Mola, but “Mola-Mola” is so much more fun to say and it’s used Bali-wide. 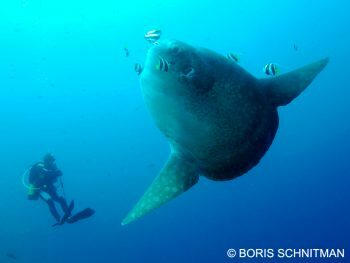 For more information, please see our Mola-Mola Bali page. 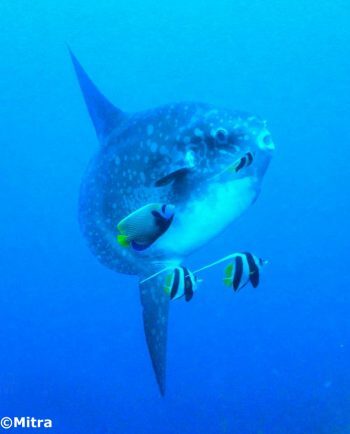 You’ll find a trip that’s 3 dives in Mola-Mola Season, pick-up from your accom being 1 hour earlier than usual (sorry, it’s to avoid the crowds).